Tattoos with a bee or bumblebee theme are becoming increasingly popular among men and women, as the diverse personalities and meanings of bees can be incorporated into a number of fun and compelling looks and designs. 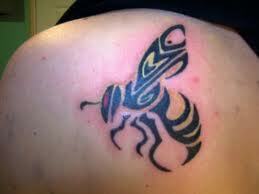 Some of the meanings of bee tattoos come from the actions of the bees themselves, as well as taking some of their perceived attributes and assigning some human qualities to them; sometimes good and bad. They can range from the pollinator, helping all sorts of fruits and vegetables successfully bloom and grow, to the infamous queen bee, who doesn't like female competition, and will work to ensure everyone knows who the female leader in the hive is. Also who can think about bees without taking into account their protective qualities, ready to use their stinger on those they believe are enemies of the colony and queen. That can represent a personality that can be aggressive in response in being attacked, or a reflection of loyalty and honor to others, helping them to counter those attacking them. So bees can be designed with the pollinator or cooperative worker in mind, or in a more aggressive look, revealing a personality that won't take any crap from others and is ready to sting back. Queen bees can also be designed in a manner of the loving mother, when she's not being challenged, to the protector of her territory at all costs; also having her stinger ready to use if need be. 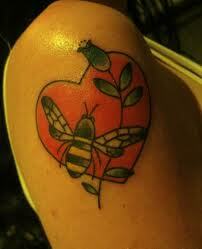 Therefore bee tattoo designs are everywhere from light, fun and loving to violent, protective and aggressive. Using other elements or themes in the bee designs also adds a nice touch for those wanting a good piece of art or desiring to send a message. Flowers and hearts are among the favorite ancillary parts of the overall design. 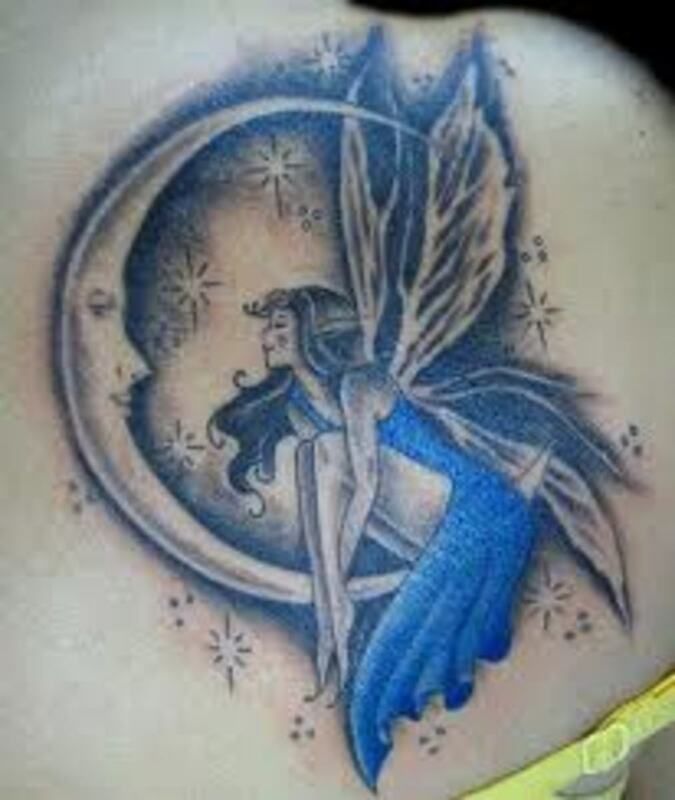 Most bee tattoos include the traditional black and yellow color, but can occasionally be changed to suit a certain mood or favorite hue, with blue wings being one of the favorites there. Finally, one of the favorite parts of a bee design is a trailing line showing the road the bee has travelled, almost always including circles and loops on its way to where it's going. I guess the desire and urge to pollinate all those flowering plants has this bee falling in love with an unknown bee that has caught its eye. The design is well done and the look in the eyes of the bee as it gazes on the recipient of its fascination is caught perfectly. This bee doesn't look like it's going to get a lot of flower pollinating done for the rest of the day, as the many hearts point to a very infatuated little bee. In modern times the iris flower is very ubiquitous and popular, making them a favorite among many artists because of its variety of colors and unique shapes, and translate well to tattoo designs, which a growing number of people are choosing to have. 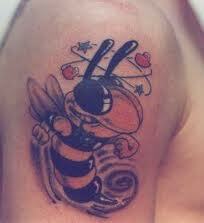 I'm not quite sure what to make of this bee tattoo. The little guy looks confused, angry, and maybe thwarted in love. He looks ready to fight and use his stinger on whoever or whatever it is that has caused his consternation. Those pointed antenna, clenched fists and bared teeth make this a great image, as does the swirling stars and hearts above his head reflecting the mood he's in. .
What I like about this particular tattoo is the simplicity of the lines, allowing for the overall statement being made to be the center of the tattoo design, rather than the art work itself. But even with the simplicity of the design the colors are very vibrant, and the shading on the flower is very nicely done. The inclusion of the large heart and flower seems to be telling someone something very special and personal. I like the big red heart in the background. 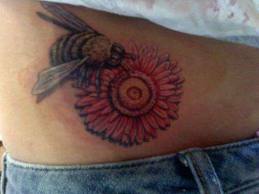 Of the bee tattoo designs I've seen, this is probably the one best portraying the real look of a bee as it pollinates a blooming flower. The detail of the flower and bee are great, and the shadowing around the edge of the flower and the wings of the bee really work well. 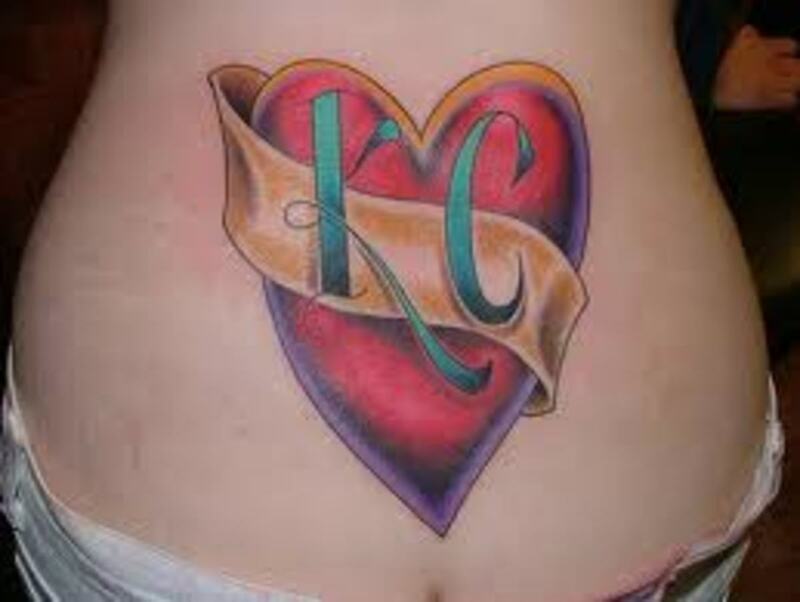 It's a good tattoo for someone seeking a realistic look and nice piece of artwork on their body. Here's a good example of a bee with blue wings, along with the trailing flying patterns mentioned earlier. Even though the colors would normally clash, with the blue of the wings placed over the yellow and black color of the body of the bee, for some reason this color combination works, giving it a very cute look. 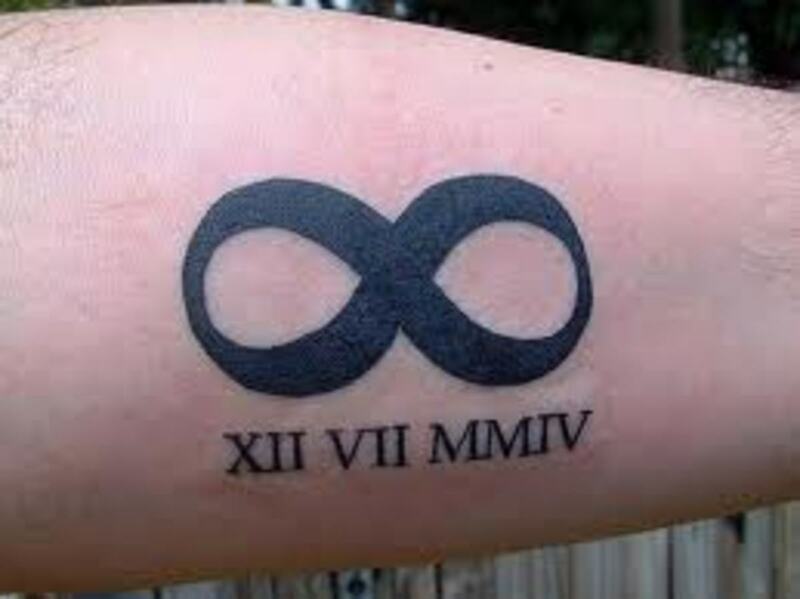 I also like the decision to only have a little of the travelling pattern of the bee, rather than the somewhat complicated ones other bee tattoo designs include, where there are numerous loops and circles that don't add much to the look of the tattoo. The lines of this tribal tattoo are very compelling to me, as the use of curves, circles and points are incorporated into the design to create a fantastic bee design. I like how the parts of the bee are separated at various points, highlighting the body of the bee without taking away from the overall appearance. Also nice is the subtle inclusion of a light touch of yellow in the body. You have to look very closely to see it, but it's there. 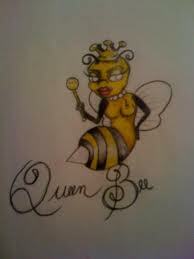 I like the sense of humor of this tattoo of the queen bee, who obviously is reflecting the attitude of person who is bearing the image, evidenced by the included words "Queen Bee." No subtlety here. She is the queen bee in her mind, and while her face is showing no emotion, the raising of the scepter and position of her stinger says she's not going to put up with any arguments to the contrary. The heavily made up face is also hilarious, adding a fun touch to the funny image. 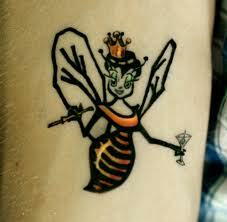 Here's another very funny tattoo making fun of the antics and attitude of the woman considering herself the queen bee. What is especially delicious about it is the way she shows none of the attributes of someone taking herself far too seriously. You know she's the queen bee; she knows she's the queen bee; and from her actions and look, it's a fact so embedded in her that she doesn't appear to consider it a possibility that there is anyone that could seriously challenge that reality in her mind. Having her holding a drink and the cigarette holder is great. 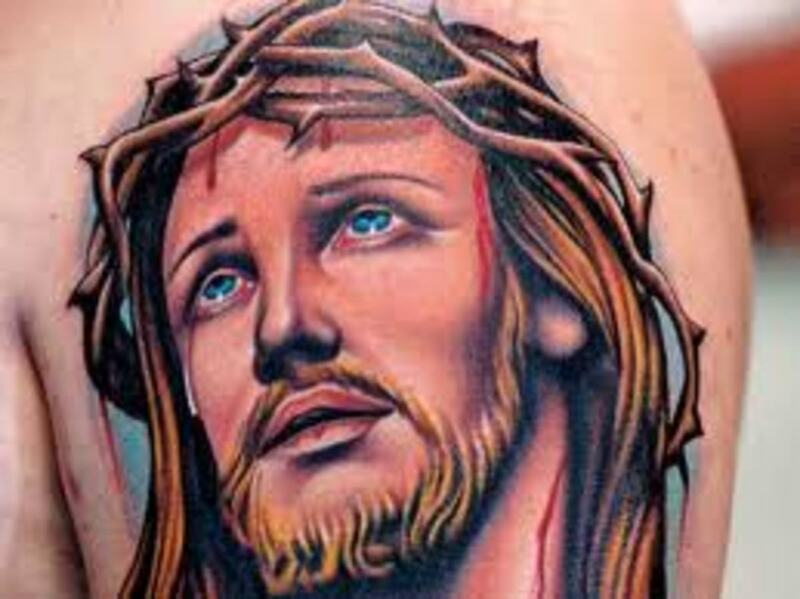 This is a tattoo design that would really generate some laughs and conversation. 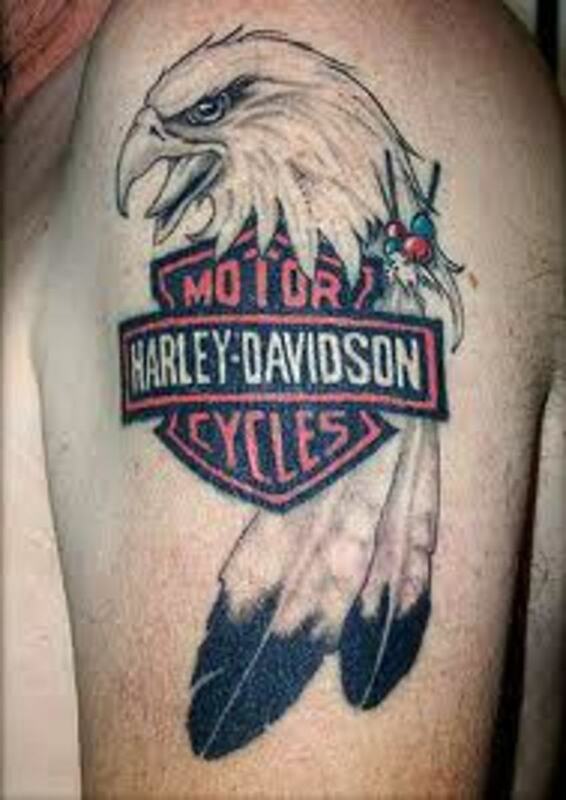 That was a fun and interesting look at the various designs engendered by tattoo artists. What seems to be so compelling about bee tattoos is the way the subject matter can be translated into human personality traits, helping to laugh at our foibles and funny outlooks, attributes and actions. When we look at these bee tattoos, in many cases we have someone immediately come to mind that fits the personality being portrayed by the bees. Some of them are also simply works of art chosen because the subject matter is desirable to the one choosing it. 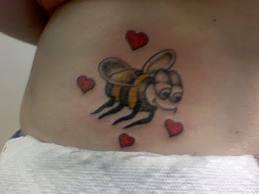 Either way, bee tattoos are a great option and choice for those with a bent towards love, humor and bees for their own sake. Cool Hub I didn't know that bee tattoos were getting so popular.